"The Heath Free Public Library was opened for public use July 17, 1894, the town having voted in 1893 to accept the provisions of the Library Act of 1890, and having received $100 worth of books as selected as a foundation for the library by the Free Public Library Commission." So reads a quote from Free Public Libraries of Massachusetts, 1899. [See complete article below.] And so began the Heath Free Public Library's history in the town of Heath, Massachusetts. The library's first years were spent quartered in the home of H. Kirk Smith, the Town's first librarian. His home, built in the late 1700's by Benjamin Maxwell Sr., is located at 15 South Road, and is known as the Maxwell House. Annual expenses, as reported in the Annual Town Report of 1896, list "Rent of Library Room, fuel, lights, and services of Librarian, $24." In 1897 a two story, 36 by 28 foot, wooden building, named Sawyer Hall for one of its benefactors, was erected at the cost of $1,400 to serve as a library and non specified "other town uses". The expense was met by contributions, including $500 from Ellsworth Sawyer of Phillipston; $100 from William Snow of Westchester, NY; $25 from John Leavitt of Watertown, IA; and from Mrs. F. E. Welch, an active participant in the building program. $400 was appropriated by the town for the purchase of a fireproof vault to house town records, and to build a room for town officers. At a later time an addition was built which added a dining room, kitchen; on the second floor was added a room for use as a pool room and a hall used for Grange meetings. Photo of Sawyer Hall printed in Free Public Libraries of Massachusetts, 1899, page 158. During the years 1899 to 1925 the library was the recipient of 30 - 35 books a year borrowed from the Woman's Educational Association of Boston, MA. In 1905 the State sent the first of a series of Vital Records of Massachusetts Towns in conjunction with a fund called the Eddy Fund. In 1908 the Librarian, H. Kirk Smith, introduced the card catalog. Grace Burrington was paid $7.45 for cataloging 1,860 books. After the death of H. Kirk Smith in 1915 the books were classified, arranged, and cataloged according to the Dewey Decimal System. From 1894 through the mid 1960's, when the library purchased a gas heater, the librarian's first job each day was to carry wood from the wood room in back of the building and light a fire in the black stove. During the years 1978-1980 Sawyer Hall was renovated. The library was enlarged to more than double its prior size, with a magazine reading room on the second floor. At that time it had a section for small children and teens, as well as a front area which was used for town committee meetings. Sawyer Hall underwent renovation again in 1997 to allow for first floor handicap accessibility. 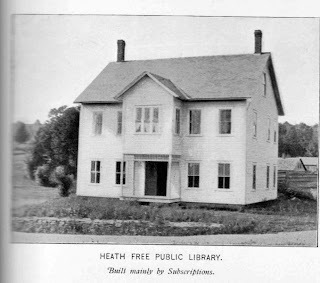 The Heath Free Public Library was opened for public use July 17, 1894, the town having voted in 1893 to accept the provisions of the library act of 1890, and having received $100 worth of books, selected as a foundation for the library by the Free Public Library Commission. The annual appropriation for its support made by the town is $15. There is also available the income of a permanent fund of $500, called the Maxwell fund, because presented to the library by the heirs of George Maxwell, late of Rockville, Conn. The books left of two school-district libraries were incorporated with the new library. In 1897 a two-story wooden building, thirty-six by twenty-eight feet in plan, was erected, at a cost of $1,400, to serve as a home for the library and for other town uses. The chief part of the expense was met by a general subscription among friends of the library, the most noteworthy contributions being $500 from Elsworth Sawyer of Phillipston, $100 from William Snow of Westchester, N.Y., and $25 from John Leavett of Waterton, Iowa. Mrs. F. E. Welch was a liberal donor, and active in obtaining the necessary funds for the building. The town appropriated $400, which was devoted to a fire-proof vault for town records and a room for the town officers. The library is open Saturday afternoons and evenings, and the annual cost of administration is $24. The trustees, three in number, elected for the usual terms, are: Mrs. Martha Barber, Mrs. Felicia E. Welch and Walter E. Kinsman. The librarian is Henry Kirk Smith. Population, 1895, 476; valuation, $189,200; volumes, 1898, 612; circulation, 399.